Mullins is undeniably endearing and earnest. As he says in his show, he’s an actor, comedian, and writer. Perhaps this is why Tinfoil never quite finds its footing. The show can’t seem to decide whether it’s a play, a stand-up act, or straight story telling. It has enough potential for all three, but in trying to be everything the show doesn’t reach the full glory of either. There are definitely funny moments, as Mullins’ comic timing is great and well honed, but when he makes a joke he has a tendency to almost apologize for it, which diminishes the funny. His charm and personality carry the show through the 55 minutes, and thank goodness for that since it’s a one man piece! Finally, his obvious sincerity regarding the subject matter is at times very compelling. Despite all the natural charisma that Mullins brings, the piece lacks overall polish. 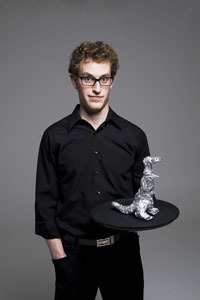 Though funny and full of promise, to me, Tinfoil Dinosaur feels more like a personal testimonial from a young man than a play performed by an actor. – Playing July 05 06:00 PM, July 06 04:45 PM, July 07 10:15 PM, July 08 02:45 PM, July 10 08:30 PM, July 11 06:30 PM, July 13 10:30 PM, July 14 08:00 PM. – Value packs are available if you plan to see at least 5 shows. – photo of Sam S Mullins by Unknown. “…feels more like a personal testimonial from a young man than a play performed by an actor.” Of course it does! That’s exactly what it is! The play HAS decided what it is- it’s a painfully honest, soulful hour of storytelling. Tinfoil Dinosaur is not confused at all- you are. I thoroughly enjoyed Tinfoil Dinosaur. It was a funny and poignant coming of age story. I hope Sam continues with stories. He could be the next TJ Dawe.